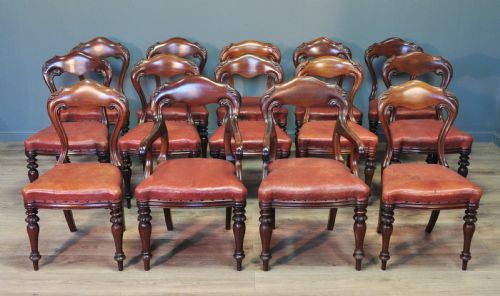 Attractive set of fourteen antique Victorian carved mahogany dining chairs with leather upholstery. 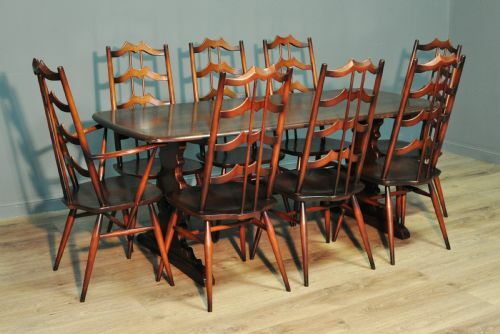 A lovely set of fourteen Victorian carved mahogany dining chairs. We date these chairs to the second half of the 19th century. The chairs sit on well turned downward tapered legs at the front and backward curved oblong section legs at the rear. The rear legs continue up with a slight outwards slant to form the backrest side supports. The legs are joined at the top by a slightly backward curved cross rail. The arch section has a stylised foliate carving at the top and inside edge. The bow front seat pads are well padded and have been upholstered in a dark red leather with stud detail. The leather is in a good usable condition but is showing a bit of wear on some of the more used chairs. There is a tiny burn hole to one pad and one of the carver seat leather has splits from past use. It's possible to see that some chairs have been used more than others. The carver chairs have the same design with the addition of armrests. The carver chairs are 36" (91cm) high with a backrest height of 18" (46cm) a seat height of 18.5" (47cm) a seat width of 22" (56cm) and a seat depth of 18" (46cm). The side chairs are 35.5" (90cm) high with a backrest height of 18" (46cm) a seat height of 18.5" (47cm) a seat width of 20" (51cm) and a seat depth of 17" (43cm). This lovely set of Victorian carved mahogany dining chairs remain in a good condition with surface markings commensurate with age and usage. Some of the chairs have some old repairs and there are some minor indentations, marks and light scratches from past use. There is a little bit of mellowing to the finish on some of the chairs due to past positioning. This remains a very stylish and elegant set of Victorian carved mahogany dining chairs which will continue to provide sterling service for many years to come. Attractive antique Victorian carved walnut sideboard in the manner of Lamb's of Manchester. A lovely Victorian carved walnut sideboard. We date this sideboard to the late 19th century. The sideboard comes in two sections: the base and the mirrored gallery back. The parts are screwed together for stability. The sideboard sits on turned legs at the front and square section legs to the rear. The sideboard has wonderful carving throughout and has lots of areas for display. The lower cupboard door has a painted daffodil panel and the top cupboard doors have carved panels depicting what appears to be greek goddesses. There is an amount of gilting to many of the edges and the rear panels have been covered in a foliate designed material. 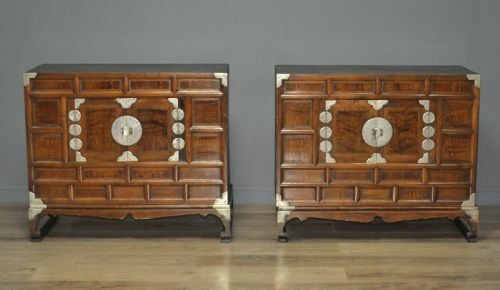 There are two small drawers to the base of the top section, these and various other panels of the sideboard have been veneered with a good quality burr walnut. The gallery back has an amount of shelves and features well turned pillars. The mirror glasses are thick, bevelled and showing only minor signs of foxing. The sideboard has a height of 97.5" (248cm) (including gallery back) with a base cabinet height of 37.5" (95cm), a width of 71" (180cm) and a depth of 22" (56cm). This lovely sideboard remains in good solid condition with only minor surface markings commensurate with age and usage. There are some minor marks and indentations to the top surface and some edges from past use. This remains a very stylish and elegant large carved walnut sideboard which will continue to provide good service for many years to come. Attractive large antique Victorian panelled mahogany break front four door wardrobe. A lovely large antique Victorian figured mahogany wardrobe. We date this wardrobe to the second half of the 19th century. The wardrobe comes in five sections, two single outer sections, a large central dome top section, the plinth base and a separate cornice. The wardrobe sits on a slightly protruding inverted break front plain plinth base. The large sturdy dome top cornice is of a stepped design. The front of the wardrobe is of four panel design with all the panels being side hinged doors. The central section sits inverted to the outer sections forming the break front. The doors have wonderful flame mahogany panels with carved corbels that sit just under the cornice edge. The interior of the outer left hand section is fully fitted with various drawers. The right hand section is fitted with a side to side hanging rail over a single deep base storage drawer. The drawers are fitted with brass drop handles mounted on pairs of shapely circular brass back plates. The central dome top section has a top shelf over a side to side hanging rail, there is a large storage drawer to the base also. The wardrobe has a height of 100" (254cm), a cornice width of 87" (221cm), a base width of 84" (214cm), a central cornice depth of 26.5" (67cm) and a central base depth of 25" (64cm). 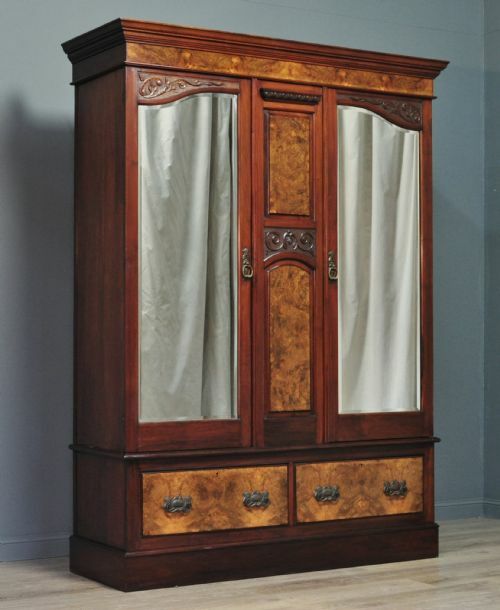 This lovely large Victorian figured mahogany wardrobe has been constructed to a high standard and remains in very good solid condition with only very minor surface markings commensurate with age and usage. There are a few small surface indentations from past use and the central lock has been replaced at some point. There is a little wear to the base from past use and there are a couple of tiny veneer chips to some edges. There is a small filled age split to the top of the cornice. 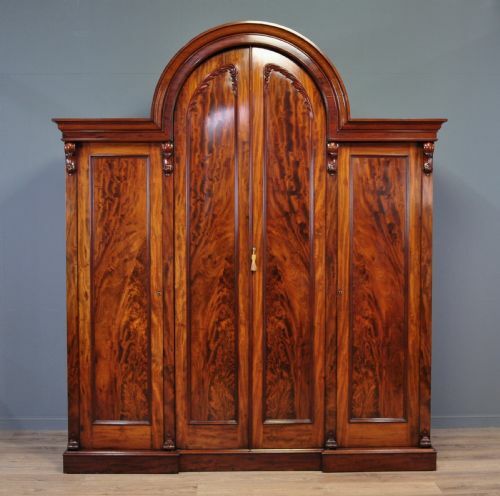 This remains a very stylish and elegant large Victorian break front mahogany wardrobe which will continue to provide sterling service for many years to come. Attractive large antique Victorian oak cylinder bureau bookcase. 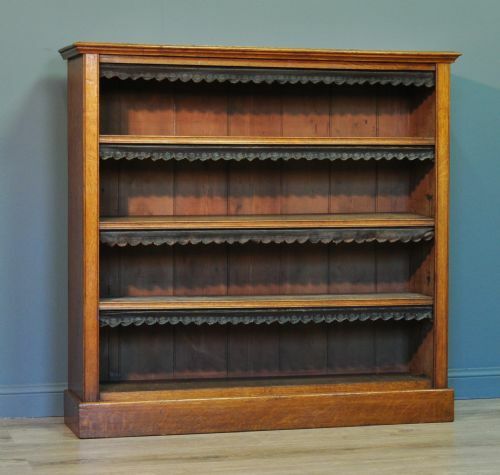 A lovely large antique oak cylinder bureau bookcase. We date this bureau bookcase to the late 19th century. The bureau bookcase comes in two sections, the cylinder bureau base and the bookcase top. The bureau sits on a plain plinth base. The bookcase section sits on top of the bureau and is screwed together. The bookcase is fitted with an integral stepped cornice. The front of the bookcase is of two panel design with each panel being a side hinged door. The doors are glazed with glass panes. The right hand door is fitted with a working lock (key supplied). The left hand door is secured with rear mounted bottom lever bolts. The interior of the bookcase is fitted with three height adjustable full width wooden shelves. The cylinder front lifts up to reveal the fitted interior. It is fitted with various pigeon holes and drawers. The lower pull out writing area extends out and has an adjustable writing slope in the centre. The writing surface has three green leather inserts. The cylinder front is fitted with a lock (key supplied). The bureau bookcase has a height of 86.5" (220cm) with a bureau height of 44.5" (113cm), an overall width of 42" (107cm), a base depth of 21.5" (55cm) and a bookcase depth of 11" (28cm). 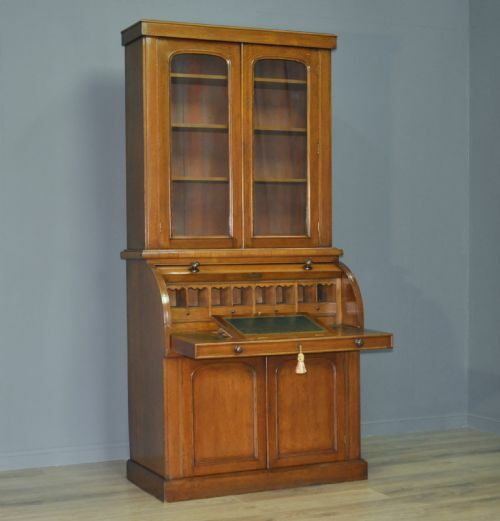 This lovely large oak bureau bookcase remains in very good solid condition with only very minor surface markings commensurate with age and usage. The finish has a few minor marks and indents from past use. There is a bit of wear to the veneers at the bottom of the plinth and there is a tiny piece of moulding missing off the outer right hand side at the back of the cornice. There are some filled age splits to the outer right hand side of the base section and to the frame beside the cylinder front at the right. 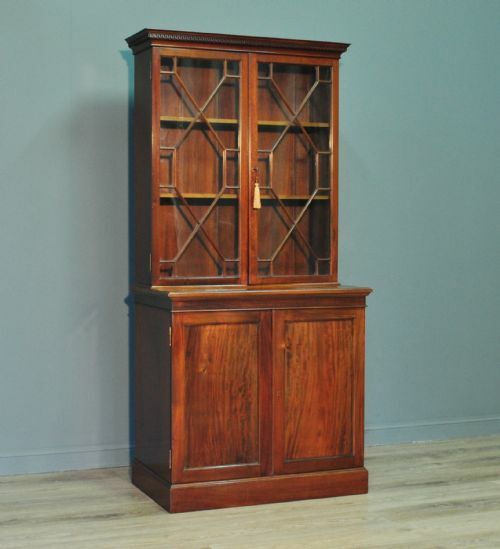 This remains a very stylish and elegant antique oak cylinder bureau bookcase. It will continue to provide good service for many years to come. Attractive large antique Victorian mahogany settee. An attractive antique Victorian settee. We date this settee to the mid 19th century. 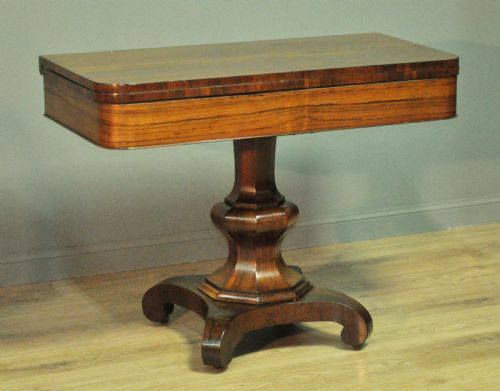 The frame is mahogany in its construction and has a faux rosewood finish, this has been done to a high standard. The settee sits on four turned legs. The front legs continue up with an attractive carved scroll armrest. The backrest is well padded and has a carved top rail. 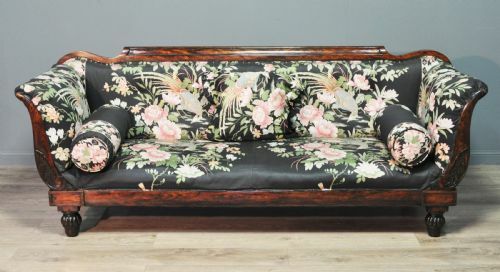 The settee is upholstered in a floral designed material on a black background. The material in in a good usable condition but has a few minor marks and light stains from past use, please note that we have not attempted to have the settee professionally cleaned. The sofa also has a throw cushion and two roll cushions. The settee has a height of 34.5" (86cm), an overall width of 90" (229cm), an overall depth of 29" (74cm), a backrest height of 21" (54cm), a seat height of 15" (38cm), a seat width of 70" (178cm) and a seat depth of 22" (56cm). This attractive antique Victorian settee remains in very good solid condition with only minor surface marking commensurate with age and usage. The material is in a good usable condition but has a few minor marks and is a little loose at some edges. There are some minor marks and indentations around the frame from past use. This remains a very stylish and elegant antique Victorian settee. It is both comfortable and supportive to sit on and it will continue to provide sterling service for many years to come. Attractive large antique Victorian mahogany bow front five drawer chest of drawers. 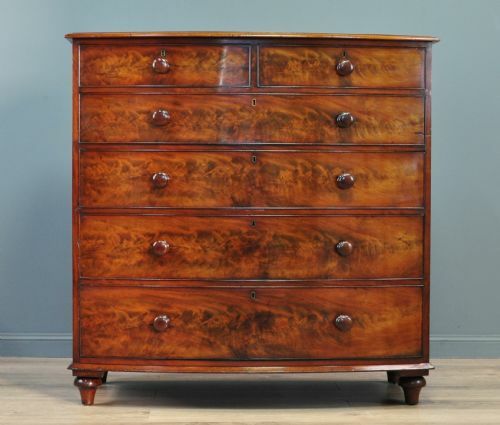 A lovely antique mahogany chest of drawers. We date this chest of drawers to the mid 19th century. The chest of drawers sits on splayed bracket feet at the front and rear. The main chest consists of five graduated drawers arranged two over three. The drawers are fitted with very ornate brass drop ring handles mounted on shapely foliate backplates. All the drawers are fitted with locks (no key is supplied but a suitable replacement should be obtainable if required). There is a band of ebony inlay running the length of the top surface and around the top edge. The chest of drawers has a height of 41.5" (105cm) a width of 43" (110cm) and a depth of 22" (56cm) at the centre. This lovely large antique mahogany chest of drawers remains in very good solid condition with only very minor surface markings commensurate with age and usage. There are some minor usage marks to the top surface and the chest has a few minor indentations. This remains a very stylish and elegant antique chest of drawers which will continue to provide good service for many years to come. Attractive large antique Victorian mahogany bow front six drawer chest of drawers. The chest of drawers sits on sturdy turned legs at the front and rear. The main chest consists of six graduated drawers arranged two over four. The drawers are fitted with bun handles. All the drawers are fitted with locks (no key is supplied but a suitable replacement should be obtainable if required). The drawer fronts have lovely flame mahogany veneers and the whole chest has been recently repolished. The chest of drawers has a height of 48" (122cm) a width of 48.5" (123cm) and a depth of 26" (66cm) at the centre. This lovely large antique mahogany chest of drawers remains in very good solid condition with only very minor surface markings commensurate with age and usage. There are some minor usage marks to the top surface and the chest has a few minor indentations. The top surface also has some indented lines from past use and a slightly lighter area to the left hand side. Attractive large retro 1970's Mcintosh furniture teak long john sideboard cabinet. 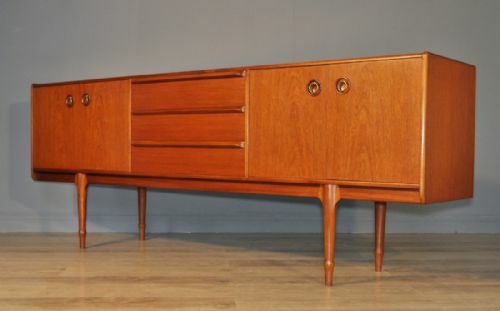 A lovely retro teak long john sideboard. We date this sideboard to the 1960/70's. There is a Mcintosh plaque inside the top drawer. The sideboard sits on four oblong section legs which taper down to a circular section at the base. The main cabinet consists of a bank of three drawers in the centre flanked by a double door cupboard to each side. The drawers fitted with top mounted shaped wood stand out bar handles. The top drawer has an internal side to side partition with seven front to back partitions behind the side to side partition. The base is lined with red baize. The doors are fitted with ring pull handles within a recessed frame in the door. The doors are secured with strong magnetic catches. The right hand door catch has been replaced at some point in the past. The interior of both cupboards are fitted with a mid mounted full width shelf, two thirds depth on the outside and one third depth at the centre. The sideboard has a height of 32" (82cm) with a width of 84" (214cm) and depth of 18" (46cm). This lovely retro mcintosh teak sideboard has been constructed to a high standard and remains in very good solid condition with only very minor surface markings commensurate with age and usage, including some minor surface marks, scratches and indentations from past use. There is a tiny veneer chip to the top of the second door from the left. This remains a very stylish and elegant retro long john sideboard which will continue to provide sterling service for many years to come. Very attractive large antique Victorian upholstered bed. A lovely Victorian satinwood bed. We date this bed to the second half of the 19th century. The bed comes in five sections, the head and foot boards the slatted base and the two wooden side rails. The head and foot boards sit on sturdy legs above large ceramic castors. The head board legs continue up to form the side supports for the large arch top upholstered backpanel. This has been upholstered in a patchwork style green material. The foot board legs continue up to form the side supports and are topped by large very well turned finials. The legs are joined at the top by a shaped footboard panel. The material is continued on the inside of the footboard. The very sturdy wooden side rails bolt to the head board and foot boards. The slatted base sits on the side boards. The headboard has a height of 74.5" (190cm) and the foot board a finial height of 45" (114cm) both by 51" (129cm) wide. The wooden side rails and sprung base will support a suitable mattress 72" (183cm) long by 51" (129cm) wide. This lovely antique Victorian satinwood bed remains in a good solid condition. The finish has a number of usage marks, indentations and light scratches from past use, primarily to the outside of the footboard. The bolts have been replaced at some point in the past and there is a small sliver of wood missing from the back edge at the bottom of the headboard. 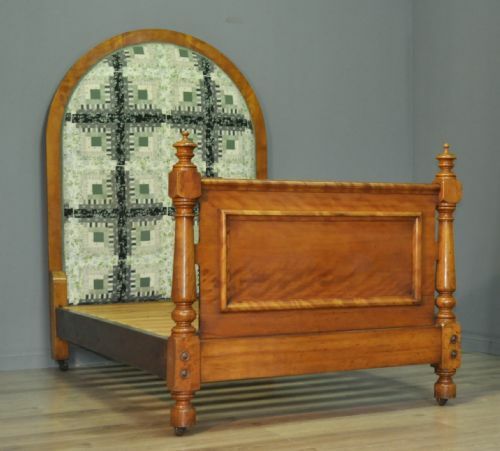 This remains a very stylish and elegant antique Victorian bed which would would add a sense of grandeur to any bedroom. Attractive antique oak dentist collectors cabinet. A lovely antique dentist's cabinet. We date this cabinet to the early 20th century. There is a plaque for 'The Martin, premier cabinet co. Sedburgh, Yorks'. The cabinet comprises of various small drawers and cupboards. The cupboards are fitted with locks (key supplied). The drawers and cupboards are fitted with turned wood handles. The top cupboard has lead glass doors and the top surface has a protective glass sheet. The bottom of the drawers also have glass sheet linings. 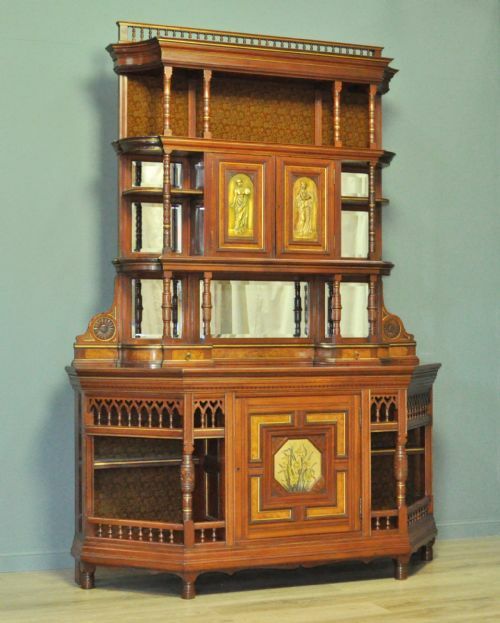 The cabinet has an height of 62" (158cm), a width of 30.5" (78cm) and a depth of 14.5" (37cm). 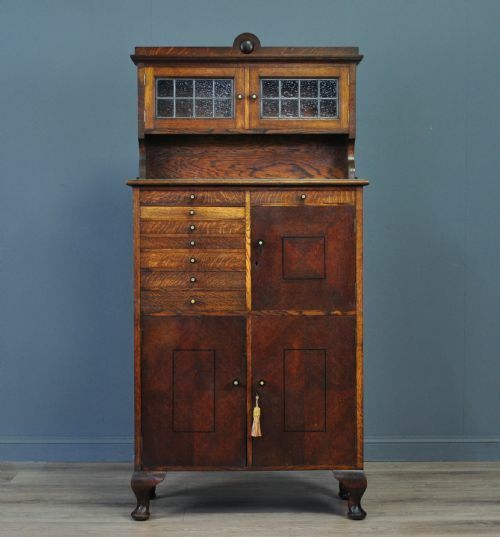 This attractive antique cabinet remains in a good solid condition with surface markings commensurate with age and usage. The very top surface has some very minor marks from past use and the glass in the top cabinet has a crack to one corner edge. The paint under the main surface glass is showing a bit of wear. This remains a very stylish and elegant cabinet. It will continue to provide sterling service for many years to come. Attractive large antique Victorian mahogany chest of drawers. A lovely antique Victorian mahogany chest of drawers. We date this chest to the second half of the 19th century. The chest is supplied as a single section. It sits on a slightly protruding plain plinth base. The chest comprises of a bank of two short over three long drawers below a subtle secret drawer. The main drawers are fitted with attractive bun handles. The drawers are fitted with locks (no key is supplied, but a suitable replacement should be easily obtainable if required). The secret drawer is operated by pulling out one of the top drawers and pushing forward against the very back of the top drawer. 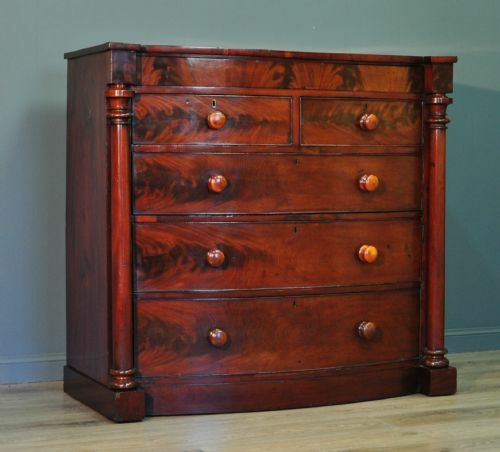 The sides of the chest have upward tapered turned columns. The chest has a height of 45.5" (116cm), a width of 49" (125cm) and a depth of 22" (56cm). This lovely Victorian mahogany chest remains in good condition with only minor surface markings commensurate with age and usage. There are a few old repairs to some of the veneers and a couple of small chips in places. There are a few usage marks to the top surface and drawer fronts from past use. 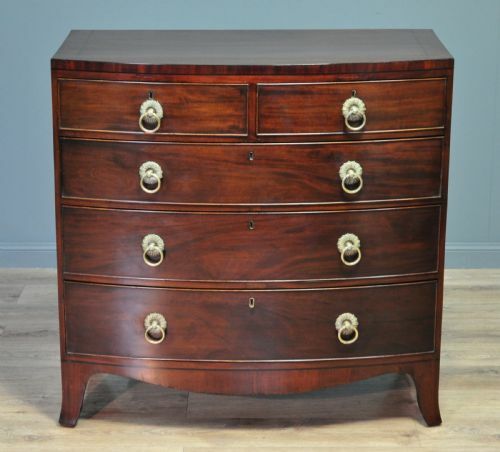 This remains a very stylish and elegant Victorian mahogany chest which will continue to provide sterling service for many years to come. Attractive pair of antique Victorian giltwood armchairs for reupholstery. 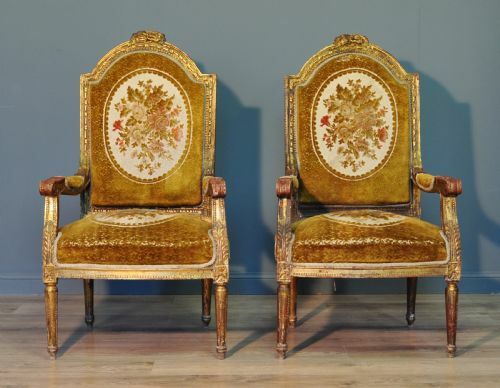 An attractive pair of Victorian carved giltwood armchairs. We date these chairs to the late 19th century. The chairs sit on downward tapered turned legs at the front and rear. The chairs are presently upholstered in a gold floral patterned velour material. The fabric is showing an amount of wear with fraying and some small holes, as such these chairs would make an excellent restoration project. The chairs have an overall height of 45" (114cm), a width of 24.5" (63cm) and an overall depth of 23" (59cm). A backrest height of 27" (69cm), a seat height of 17" (43cm), a seat width of 18" (46cm) and a seat depth of 18.5" (47cm). This attractive pair of Victorian armchairs remain in a good condition, a perfect project for someone with the requisite skills. There is a bit of wear to the giltwood from past use. This remains a very stylish and elegant pair of Victorian armchairs. They are very comfortable and supportive to sit on and will continue to provide rest and relaxation for many years to come. Attractive antique Victorian carved walnut triple sized wardrobe. A lovely antique Victorian walnut triple sized wardrobe. We date this wardrobe to the late 19th century. The wardrobe comes in 4 main sections being the base, cornice and the two hanging sections. The wardrobe sits on a plain plinth base and has a large stepped cornice. The front of the cupboard is of a three panel design over a large double base drawer section. The central panel is held in place by dowels and is flanked by two shapely mirror doors. The central panel has very attractive burr walnut veneered panels with applied mouldings. There is further carving to the facia with a foliate design. The outer mirror doors are fitted with attractive drop loop handles mounted on shapely backplates. These handles also turn to operate the catches. The doors are also fitted with locks (no key is supplied but a suitable replacement should be easily obtainable). The interior of each hanging section is fitted with a side to side hanging rail. The large base drawers each have a pair of drop handles mounted on art nouveau backplates. These drawers also have burr walnut veneered panels. The wardrobe has a height of 81.5" (207cm), a cornice width of 60 (153cm), a base width of 58" (147cm), a cornice depth of 21" (53cm) and a base depth of 19.5" (50cm). This lovely antique wardrobe remains in very good solid condition with minor surface markings commensurate with age and usage. There are some minor marks and indentations to the finish and edges from past usage. The wardrobe retains its original material lining, this is in a good usable condition but has some usage marks from past use. This remains a very stylish and elegant large antique wardrobe. It will continue to provide good service for many years to come. Attractive antique Victorian oak chest of five drawers. 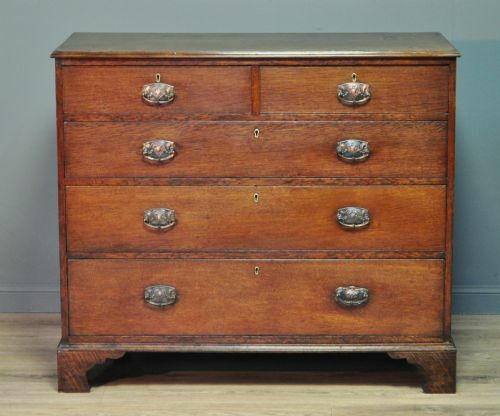 A lovely antique oak chest of drawers. We date this chest of drawers to the mid 19th century. The chest of drawers sits on four bracket feet. The chest consists of two short over three long drawers. The drawers are fitted with decorative cast drop handles mounted on shapely back plates. The handles have been replaced with period ones at some point in the past. The drawers are fitted with locks (no key is supplied but a suitable replacement should be easily obtainable if required). The chest has an overall height of 39" (99cm), an overall width of 46" (117cm) and an overall depth of 21" (53cm). This attractive oak chest of drawers remains in very good solid condition with minor surface markings commensurate with age and usage. There is some minor wear, indentations and marks to the top surface. There are a few old filled worm holes to the rear but we have treated these to make sure. This remains a very stylish & elegant oak chest of drawers providing useful storage space. It will continue to provide good service for many years to come. Attractive antique Victorian mahogany chest of drawers. The chest is supplied as a single section. It sits on a slightly protruding plain plinth base with an inverted breakfront design. The chest comprises of a bank of four long graduated drawers. The lower drawers are fitted with turned wood handles and the top drawer is opened by using recessed handles just under the drawer edge. The chest has a height of 49" (112cm), a width of 43.5" (110cm) and a depth of 20" (51cm). 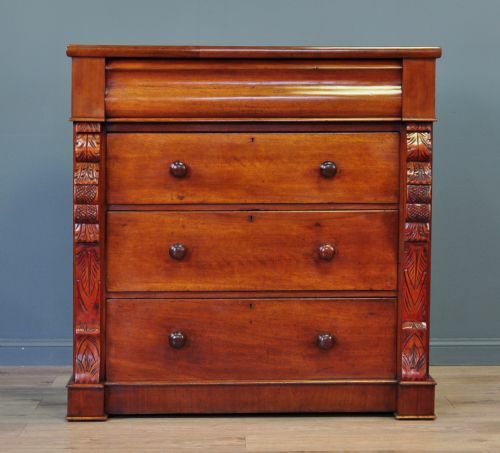 This lovely Victorian mahogany chest remains in good condition. There are some minor marks, indentations and slight wear to the finish. The top surface has a few minor marks and indentations to the finish. There is a small veneer repair to the top left hand side of the chest. 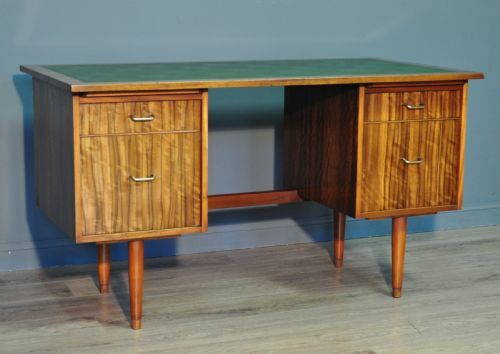 Attractive retro 1960/70's twin pedestal office writing desk. 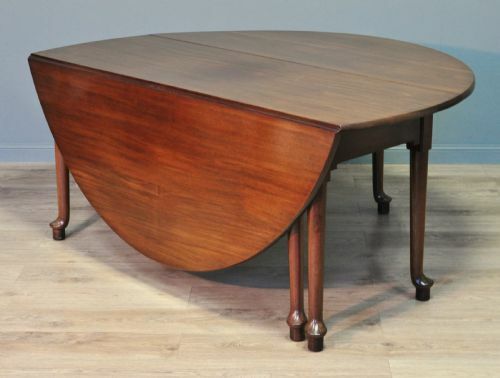 A lovely retro walnut desk. We date this desk to the 1960/70's. There is a stamp for 'Morris of Glasgow' inside the drawer. The desk is supplied as a single section so please be aware regarding access etc. The pedestals each sit on two downward tapering legs. Each side of the desk has a pull out slide with two graduated drawers below. The bottom drawers are quite deep and could be used as filing drawers. The drawers have small metal bar handles and the top surface has a green vinyl insert. The desk has an overall height of 29" (74cm), a width of 51" (130cm) and a depth of 27.5" (70cm). 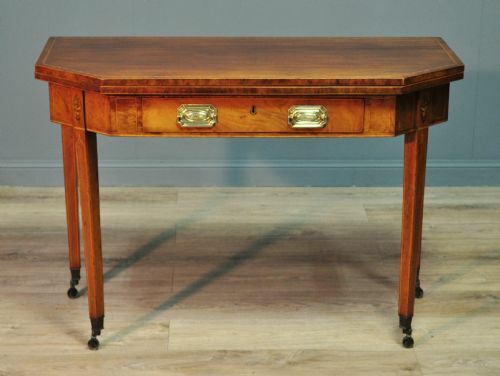 This lovely retro desk has been constructed to a high standard and remains in a good solid condition. There are some minor marks to some of the edges and finish. The very bottom of the legs are missing the small metal caps. This remains a very stylish and elegant retro desk. It will continue to provide sterling service for many years to come. 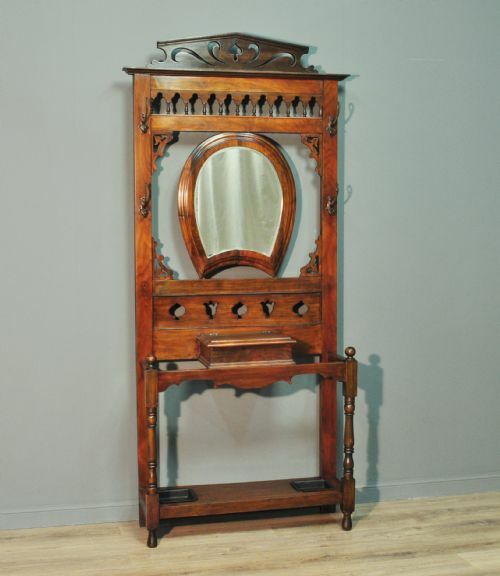 Attractive antique Victorian walnut mirror back hallstand. A lovely Victorian walnut hallstand. We date this hallstand to the late 19th century. The hall stand sits on two decorative turned legs at the front and two oblong section legs at the rear. The back features four double coat hooks with a central mirror. The mirror glass is thick and bevelled and is showing only minor signs of foxing. There is a lidded box below the shelf which is flanked by two open stick/umbrella areas over base drip trays. The hall coat stand has a height of 85.5" (217cm), a width of 40" (102cm) and a depth of 12.5" (32cm). This lovely Victorian hallstand remains in a good solid condition with only very minor surface markings commensurate with age and usage. There are a few indentations to the frame from past use and the shelf holding the drip trays is showing a bit of wear. The lower double hooks have been removed at some point in the past and there is a small age split to the mirror frame at the bottom. This remains a very stylish and elegant Victorian hall stand which will continue to provide good service for many years to come.